You’ll never miss the gluten in this Gluten Free Banana Bread Recipe. It’s simply delicious and it’s made without refined sugar and can be made egg free. Baking a gluten-free banana bread is much easier than you think. The secret is the all-purpose gluten-free flour mix. I have a fantastic gluten-free flour mix recipe that you can make and store in your pantry. This recipe is free of refined sugar and there’s an option to go egg free too. It’s a healthy morning breakfast, lunch box treat, afternoon snack or late-night dessert that both kids and adults will love. 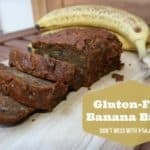 My family is addicted to this Gluten Free Banana Bread Recipe. I get requests to make it every weekend. I prefer to bake the banana bread in mini pans. I find that the ingredients hold up better – and there’s the perfect mix of a moist center with firmness on the edges. 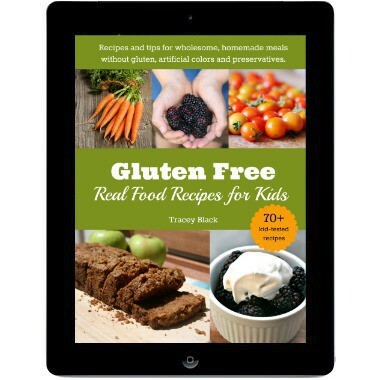 Check out my new book, Gluten-Free, Real Food Recipes for Kids. I wrote this book with YOU in mind. Parents who want to provide kids with wholesome meals without artificial colors, preservatives and other additives. All the recipes are gluten-free – with many options for grain free or Paleo, dairy free, egg free and vegetarian. Did you try this Gluten Free Banana Bread? Don’t forget to rate the recipe and comment below to let me know how it went. You can also FOLLOW ME on Facebook, Instagram and Pinterest to see what other fun things I’m getting up to. You'll never miss the gluten in this Gluten Free Banana Bread Recipe. It's simply delicious and it's made without refined sugar and can be made egg free. I love this recipe, perfect for breakfast with coffee! Very nice gluten free recipe! Is it just me or does the heading say egg free and then the ingredients calls for 2 eggs? Caitlyn is allergic to eggs so I’m always looking for good substitutes.